Free GM Resource: 3d Printer "Stuff"
This week's Free GM Resource is a twofer and a real-recent re-hash...definitely NOT a threefer. In February I offered up the newsletter from Fat Dragon Games. 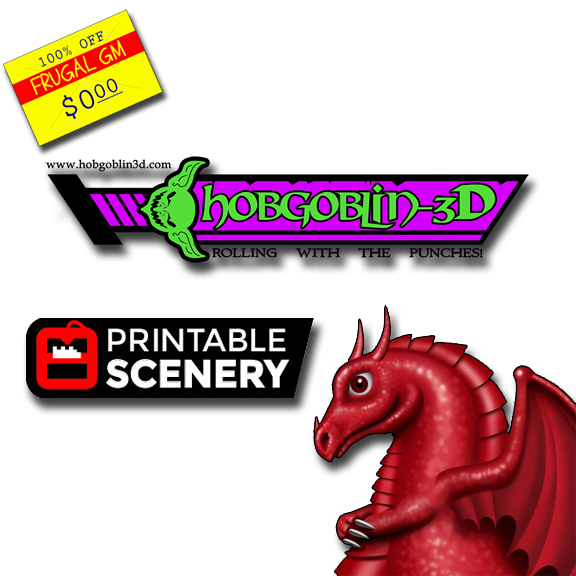 This week I'd like to add a newsletter from Hobgoblin 3D and a newsletter from Printable Scenery. I know the idea of 3D printing might not seem to fit in with being "frugal", but for me it has always been about getting a good value for your money and not just trying to save a buck or two. With the prices of 3D printers coming down and the availability of great 3D models going up...I think the time is coming. So far I've received newsletters from Fat Dragon Games and Hobgoblin 3D, but nothing from Printable Scenery yet. The newsletters I've gotten so far have had freebie 3D files and even a good tip or two with regards to getting the most out of your prints. I hope to get my 3D printer up and running soon so I can take advantage of what this new technology has to offer.